Sponsored by Skype — Use Skype Credit to call mobiles and landlines home and abroad at low rates. Most of us are busy — and probably busier than we’d like to be. Between work, family, friends, staying healthy, and having fun, there’s just so much to do! Thankfully, technology offers several great ways to save you time. In fact, not only do the tools below save you time, but they save you time on some of the tasks you probably like the least. 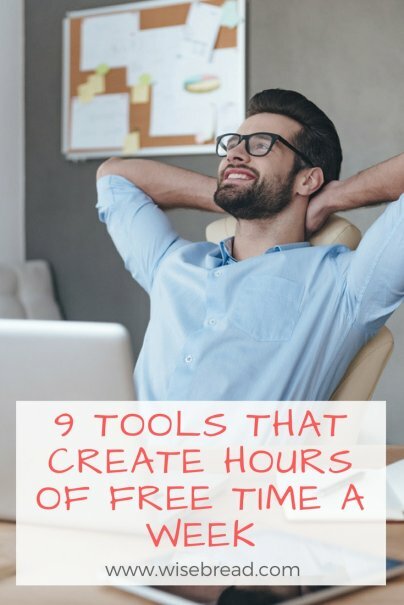 Read on to discover how you can be saving hours a week. While I love the idea of making my office paperless, I just don’t have the time to scan every single important piece of paper that comes my way. That’s why Shoeboxed is so great. You can send off your documents (in a prepaid envelope), and the nice people at Shoeboxed will scan, categorize, and organize all of your documents for you. You can also shoot them online receipts and confirmations via email or through their app. That way, everything is gathered and organized for you in one place when you need it. No more panic time during tax season. It’s time to go paperless! Devoting time to email every day is part of life — and sometimes, even just managing and organizing your email can take up a significant portion of your work day. But what if you could cut down that time with a simple, easy-to-use tool that makes it easier to manage those emails? If you need to send an email at a specific time, you can write an email now but schedule it to be sent later. If you’re not ready to deal with an email right now, you can have Boomerang send it back to you when you need it. If you’re waiting on a response, you can set Boomerang to remind you if no one responds, so you never forget to follow up. You can schedule Boomerang to send you a email reminder for anything — birthdays, anniversaries, or dreaded bill due dates. There’s no need to clutter up your inbox with emails that you can’t do anything with just yet. Schedule a message with Boomerang, and you’ll be reminded only when it matters. Email subscriptions can be useful — they can help you learn new things, save money on things you would normally buy, and keep you up-to-date on the world. But if you feel like it takes too much time to read all of these individual emails, Unroll.me can help — the service gathers up all your subscription emails into one daily message. Your subscription emails will be filed away, too, so they don’t clutter up your inbox, and you still get a chance to read them through the daily digest. See anything in there no longer care to read? Unroll.me makes it easy to unsubscribe too. Ever have a meeting with someone, they’re running late, and you’re wondering where they are? How about if you’re going out with a group, and you’re separating for a while and need to meet up again at a designated spot? Glympse takes all the “Where are you?” and “Be there in x minutes” texts and calls away. Instead, Glympse allows you to share your location with anyone for a specific period of time. The people you’re meeting up with can check your location using a smartphone, tablet, or computer. You can turn off the location share at any time, or it will just expire after the designated time. This is especially great if you’re waiting for someone. If you can see that they’re still a half-hour away, you have time to run errands or do other things that you need to do, instead of just waiting around doing nothing. If you own an Android phone and have ever felt frustrated because it takes so long to tap out a message, get Swiftkey! Instead of typing out each letter, Swiftkey allows you to flow from one letter to the next, letting you write whole phrases without lifting a finger. Even if you are slightly inaccurate, the app will correct it to the right word. It can even predict what you are going to write before you finish (by learning how you write). Sleep tracker apps help you get in touch with your circadian rhythm and make sure you’re going to bed and waking up at optimal times. More efficient sleep means you don’t waste time tossing and turning or feel groggy because you wake up in the middle of a sleep cycle. Depending on which smartphone you have, you can find a good app that will track your movements and give you tips on when and how to sleep. Some of these apps also have added features of gentle alarms and sleep logs. Here’s a review we did on sleep tracker apps earlier this year. Have you ever written down a great idea, then had to shuffle through piles of paper or flip all the way through an old notebook to find it again? It’s a huge time waste. Now, imagine a notebook that contains all your notes for various projects, reminders, and ideas — even a journal. But the key to this notebook is that is searchable, and it’s accessible from computer, tablet, or smartphone, and even shareable. That’s Evernote. You can put everything you need, from webpages to snapshots to text notes, all in one place. You can even record audio! You can place them in separate folders (or notebooks) — or not — it’s all searchable anyway. Skype is my favorite communication tool. I use it daily for work and at home. It’s the simplest and cheapest way to stay in touch with friends and family, especially if they’re out of the country. I love Skype’s online status notifications, which tells you if the person you want to contact is available before you even call them. Skype video calls can save you a lot of time. Some things are just easier explained over a video call. You can use video calls to do anything from helping your husband pick out the best tie while on a business trip, to helping your hapless single friend decide if that three-day old meatloaf is still edible. The ability to send SMS messages directly from your computer. This is great for us non-teenagers who prefer to type on keyboards instead of struggling with smartphones. Connect to Skype Wifi at over 2 million spots worldwide. You can conduct business while on the go without worrying about missing deadlines. Set up call forwarding to a mobile or landline of your choice, so you don’t have to worry about missing any important calls from the office. How many times have you forgotten your password for a site you haven’t visited in a while? This used to happen to me when I logged into my various financial accounts each month to pay my bills or access my statements. After trying several times, I’d have to hit the “reset password” button, go into my email, click the link, and reset the password before I could get to what I needed to do. Even worse was when I maxed out the tries and had to make a phone call to unlock my account. Not only did it take time, but it totally derailed me from what I was doing. Now that I have LastPass, however, that will never happen again. The best thing about LastPass is how easy it is. Just log in to an account, and LastPass will prompt you to save the password, which it keeps secure. You can also share passwords (without actually sharing the actual password) with someone else, if you need to give someone access to your accounts. Then delete them when you no longer want to share access. LastPass also has features that allow you to create secure notes and files, as well as create backups of your sensitive documents. Heard of the last three before, but the first six are gold. I'm especially liking the functionality of being able to schedule e-mails using boomerang. Surprised it's features aren't stock standard with gmail to be honest (or maybe they are, but just hidden under the hood). These are all great tools ... efficiency is the name of the game! Cloud-based file-sharing services (like Google Drive, Dropbox, and others) are also really handy (and free!) I use Dropbox, which allows me to save - and access files - from various locations. It is especially helpful when I'm working on documents that I want to access from both my home and work computer. It was a lifesaver when I had to replace a laptop computer - no need to recover files from an external hard drive or flash drive; they were all waiting in my Dropbox folder(s)! These are all great! I never use the sleep tracker on my FitBit wristband, but I do wear my wristband 24/7. FitBit is not as accurate as my free phone apps, but it does enforce good habits. I am incentivized to do my errands on foot, especially since I know that I'm using as many calories as I would at the gym...without the gym membership or the time out of my schedule to exercise at the gym. This is a great list. I've never heard of Boomerang before, but I will use that to schedule emails. What a time-saver! Will definitely check out Boomerang. Glympse could also be useful for keeping track of your teenage children, making sure they are where they say they are. Skype is of course a firm favorite as a time and money saver.